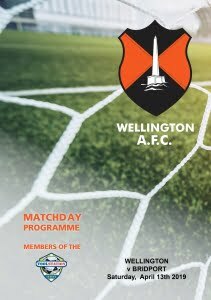 Wellington entertained Bridport in the Toolstation Western League Premier Division in their final home game of the season at the Playing Field having lost 3-0 to them in the FA Cup, following a 0–0 draw, and 3-0 in the League. Clive Jones had Scott Drayton and Joe Chamberlain back in his line-up but was without the unavailable Jack Bown-Porter. Bridport had much the better of the earlier exchanges as Wellington tried to contain them. They came close with a header and free-kick that were just off target before Edward Butcher put his shot wide from a good position. They gained the lead, however, in slightly bizarre circumstances when, on 19 minutes, stalwart defender Tim Legg uncharacteristically played the ball back into his own net without checking the position of keeper Josh Mclean. 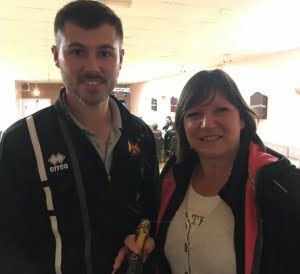 Lively Bridport winger Leighton Thomas continued to cause Welly problems but they gradually gained a bigger share of the ball and created some opportunities of their own. Skipper Glen Wright sent a header goal-wards but it lacked power before good play between Joe Wylie and Josh Wadham set the same player up with his shot going just wide. Bridport came close to increasing their lead through Butcher but Mclean came to the rescue with a superb save. Wellington finished the half on top and were unlucky to reach the break a goal down as a Wadham free-kick was headed back in by Jack Bryant to brother Conor whose header was tipped over the bar by keeper Jason Hutchings. The Tangerines were level, however, after just one minute of the restart when Jack Bryant, who showed great determination throughout, shot from way-out on the right and the ball sailed beyond Hutchings and bounced into the net off the inside of the far post. Five minutes later, a rampant Welly surged into the lead when Wylie ran on to a good ball down the line, cut in and sent a pinpoint pass to the far post where the incoming Joe Chamberlain was able to convert. Bridport tried to hit back but Mclean was on hand to again deny Butcher, putting his effort behind for a corner after which Wellington began to dominate proceedings. Conor Bryant was put clear, shooting just wide as the keeper advanced, but when he was released again, outpacing his pursuers, central defender Chris McGrath tripped him from behind and was red-carded by the referee. The home team were not to be denied, however, and scored one of the best goals of the season with Conor and Jack Bryant, Wadham and Wylie combining with the latter again crossing accurately for the alert Chamberlain who, this time, cut across a defender at the near post to put the ball into the corner of the net. Wellington sealed their victory with a fourth goal which came when Scott Drayton played a through ball for Wylie and he found substitute Lewis Pocock free to score his second senior goal with ease. Bridport’s ten men never gave up and were rewarded when hard-working Kameron Andrews found himself unmarked and gave Mclean little chance to make the final score 4-2. Wellington had played some of their best football of the season, with everyone playing their part, and Mitch Woodgate being named ‘Man of the Match’, on a pitch that was testament to groundsman Mike Boyd who has worked hard throughout the season to keep it in much improved condition. The team have three hard away matches to finish the campaign but can now look forward with some optimism. On Good Friday, kick-off 1pm, they play high-riding Bridgwater Town, who have their high-scoring talisman and former Wellington centre-forward Jack Taylor suspended following a tenth yellow card last Wednesday, and then meet title hopefuls Willand on Easter-Monday, kick-off 3pm, and finish at Clevedon Town the Saturday after.